This Mission table lamp is suitable for either the office or the home and is very simple in design and construction. Mission Table Lamp. 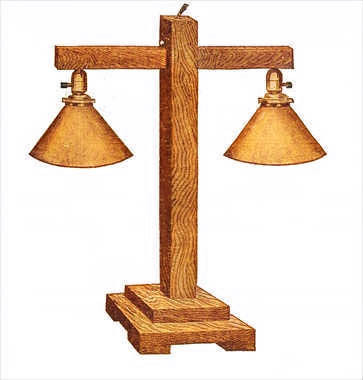 Click here for detailed mission table lamp plans. 1 post, 1-1/2 in. sq. by 23 in. 1 arm, 1-/8 by 3/4 by 13-1/2 in. 1 block, 3/4 in. thick by 6 in. square. 1 block, 1 in. thick by 9 in. square. Square up the base blocks and fasten them together with screws as shown in the detail sketch. A mortise, 1 in. square, is cut in the center of the blocks for the center post.. Lead weights, covered with felt, should be attached to the bottom, as shown. The post has a tenon cut on one end to fit the base, and a mortise cut in the other for the arm. Holes are bored in the arm from the ends for the wires. They can be plugged after the wires are in place. A hole is also bored in the top of the center post to connect with the holes in the arm for the lead wire. It is best to glue the joints together, although this is not necessary if the joints are a tight fit. Sandpaper the parts thoroughly, then stain to match the other furniture.